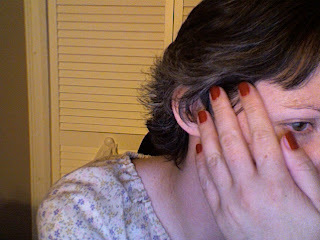 My hair is short and my nails are red. Sorry, no crafting until the polish comes off. There is a price to pay for beauty, I guess. But the chipping is part of the fun! It's like looking for pictures in the clouds - last time I painted my nails red an eagle showed up on my left middle finger. Craft away! If you get sad I'll paint your nails again.